Paintball is an extreme sport and is not one that is designed for children. This is because there is a big chance that they could sustain a serious trauma. Paintball equipment must meet safety standards. Helmet and goggles must be worn at all times and must fit properly. It is very important to NEVER remove the eye protection during play or even on the playing field. Game rules should always be followed. 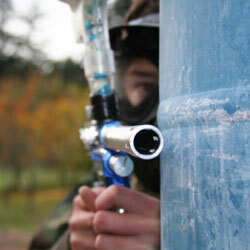 Close supervision by trained personnel at a paintball facility is essential. This should not be done as a backyard activity as all of the above cannot be guaranteed.